Line pans or ramekins with banana leaves or wax paper . Whisk together rice flour, glutinous rice flour, baking powder, and salt in a bowl. Beat eggs in a bowl. Add sugar and beat well. Add butter. Alternate adding flour and coconut milk. Beat until just blended. Do not over beat the batter. Divide the batter equally into the pans. 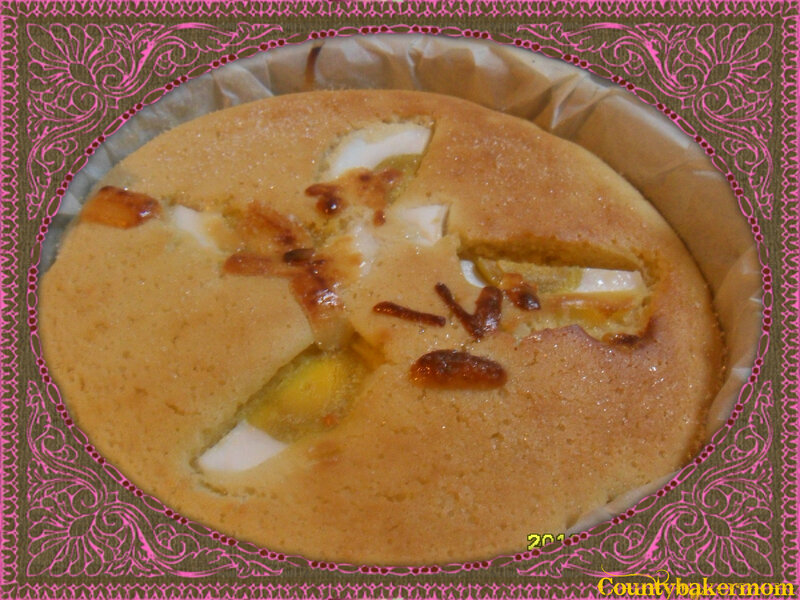 Lay slices of salted egg on top and set the cakes on the top rack of the oven. 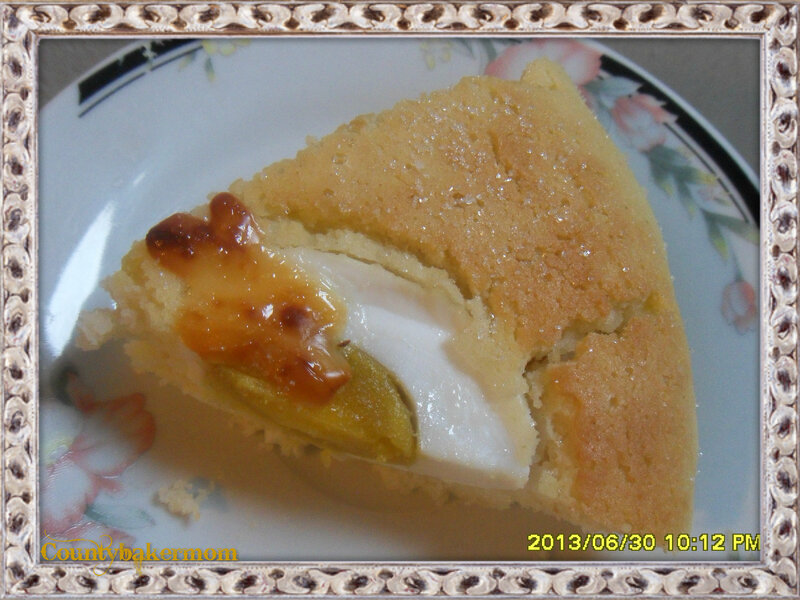 Bake until the cake is cooked through, 20 to 25 minutes. Turn the broiler to low and broil the cakes to brown the top for about a few minutes. Watch cakes carefully to keep them from burning. Brush the cakes with butter and sprinkle with sugar, grated coconut, and grated cheese. Serve warm. 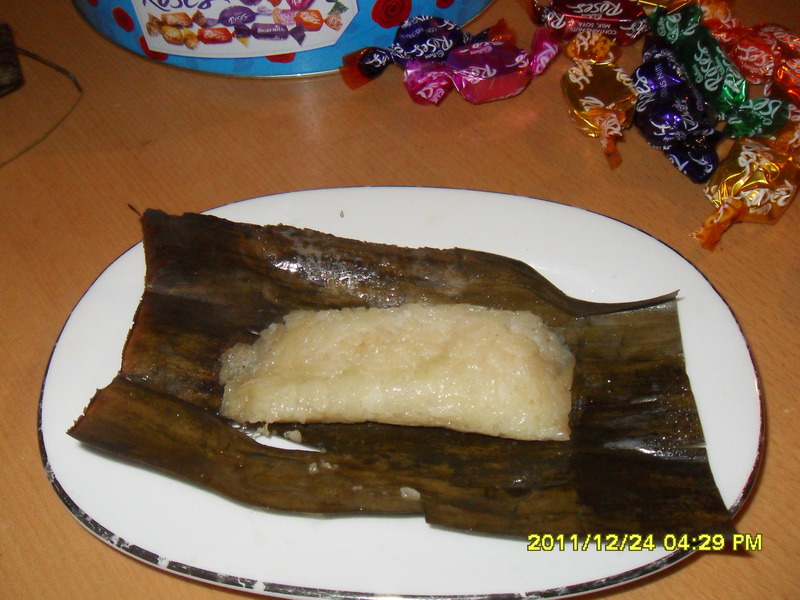 Suman is another native delicacy of Filipinos. 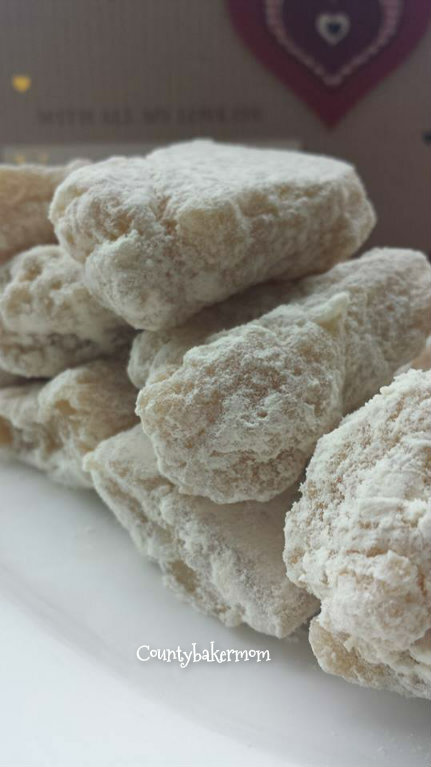 I have seen frozen suman in some asian stores but I did not want to buy it instead I want to make it on my own. 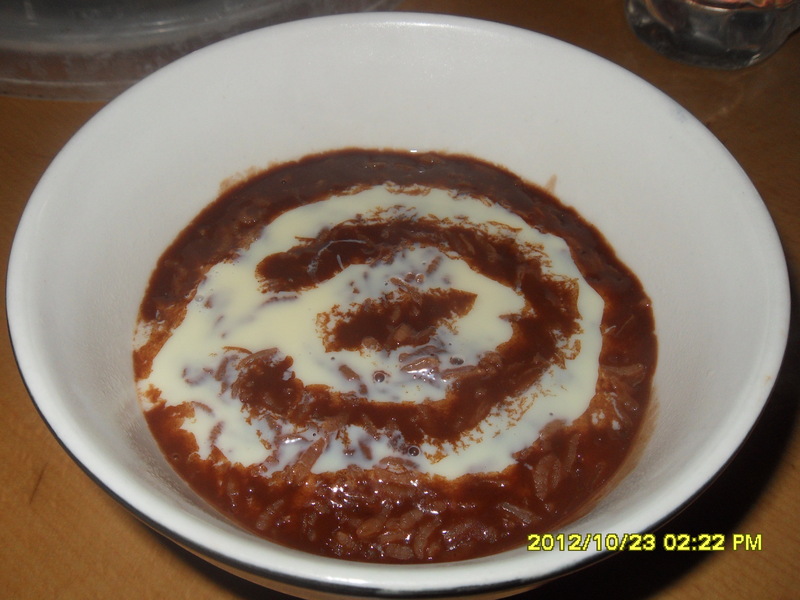 Good thing is that I have found a recipe that is perfect for my taste :)here is the link BUSOG! SARAP! Place the sticky rice on a large bowl and immerse it in water. Soak it for about 1 hour. Drain sticky rice and combine with coconut cream and salt. Cook it in rice cooker. Keep stirring till there’s no more visible liquid. Stir in the sugar till well combined. 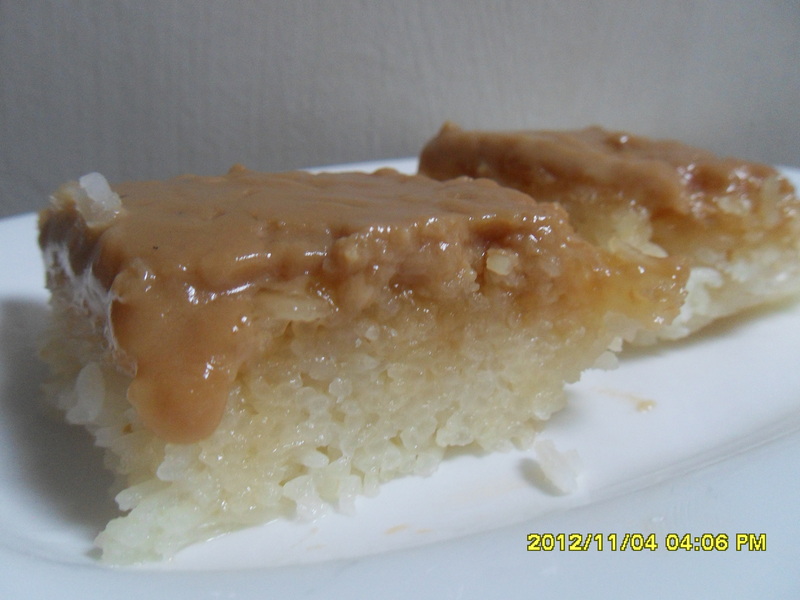 The mixture should be like a wet steamed rice (half cooked) appearance, with a bit of coconut cream coating the sticky rice. Turn off the rice cooker and take out the rice cooker bowl and set aside to cool. Prepare your banana leaves: if you’re using frozen ones, defrost it first. Using a clean wet kitchen towel/paper towel, wipe the leaves. Sanitize the leaves over an open flame or stovetop. 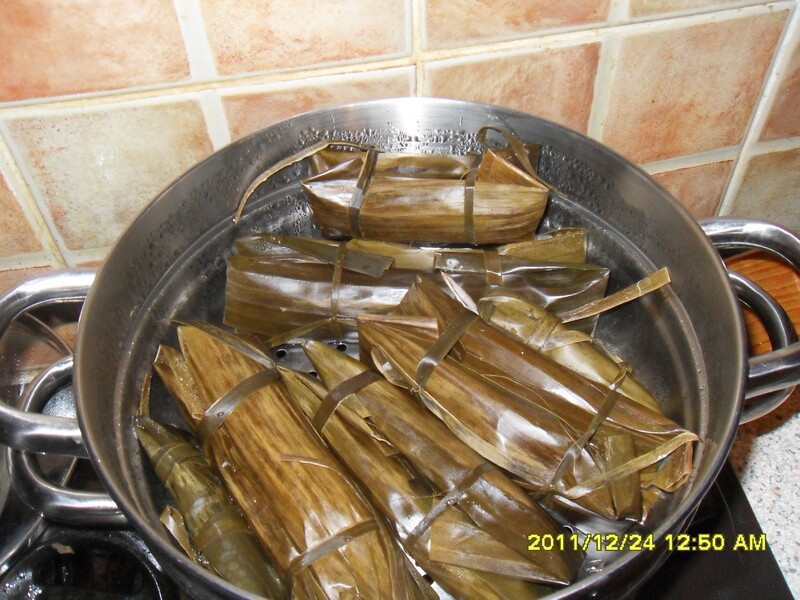 Wrap your cooked rice in banana leaves and steamed it for 40 minutes.